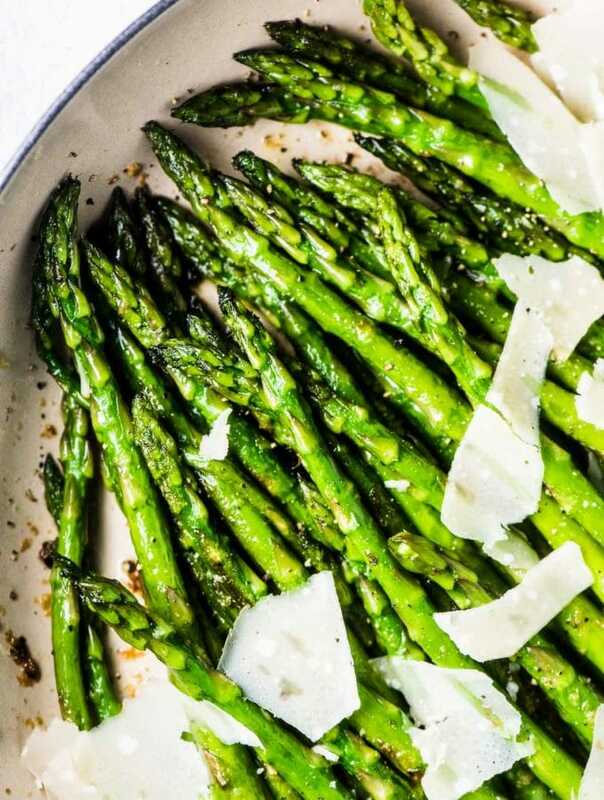 Want a simple, healthy, and guaranteed to please dinner recipe? 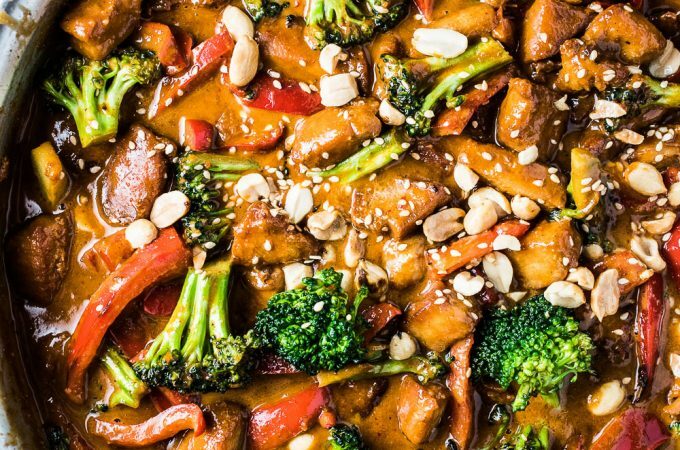 This delicious Saucy Peanut Chicken is it. Healthy chicken breasts and veggies are cooked in an easy to make and super flavorful peanut sauce. Serve it over rice or low carb cauliflower rice (my fav!) for a quick weeknight dinner! Saucy peanut chicken! with red peppers and broccoli! and bucketloads of sauce! This is a back pocket recipe that is a cinch to whip up and loved by all. Cause hello, it's a Thai flavored peanut sauce. Who doesn't love that? It's also crazy fast and easy to make and full of good for you ingredients. 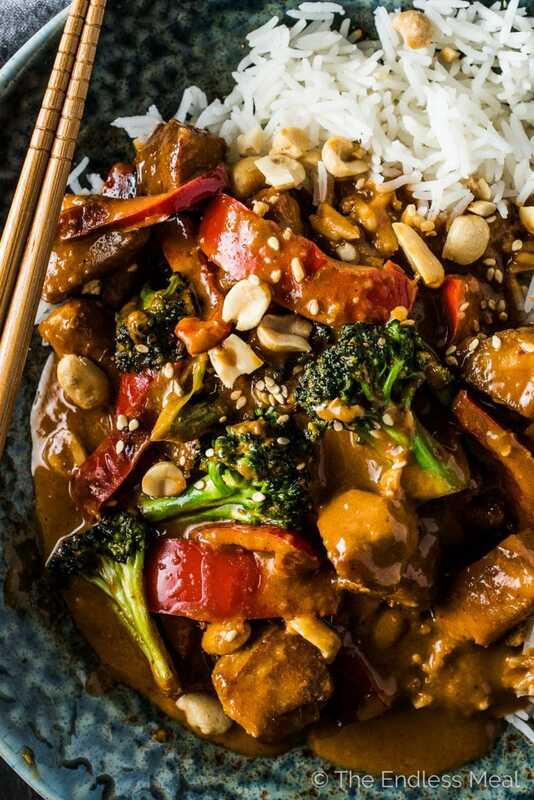 This saucy peanut chicken recipe is winning all around! ??? → Chop the chicken into chunks then cook it until it starts to brown. → Make a simple (but crazy delicious!) 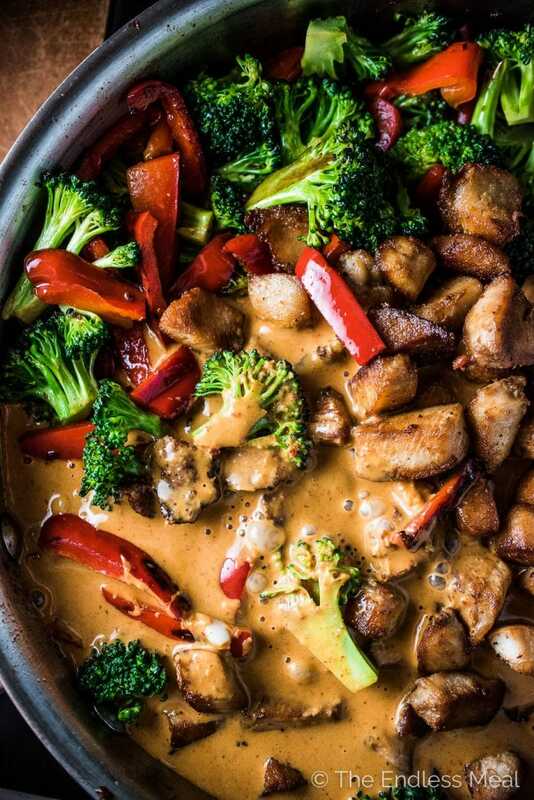 peanut sauce by whisking together a few tasty, Thai-inspired ingredients while the chicken is browning. → Take the chicken out of the pan and pop the broccoli and peppers in and give them a quick stir-fry. → Pop the chicken back into the pan then pour in the sauce and let it simmer for a couple of minutes. 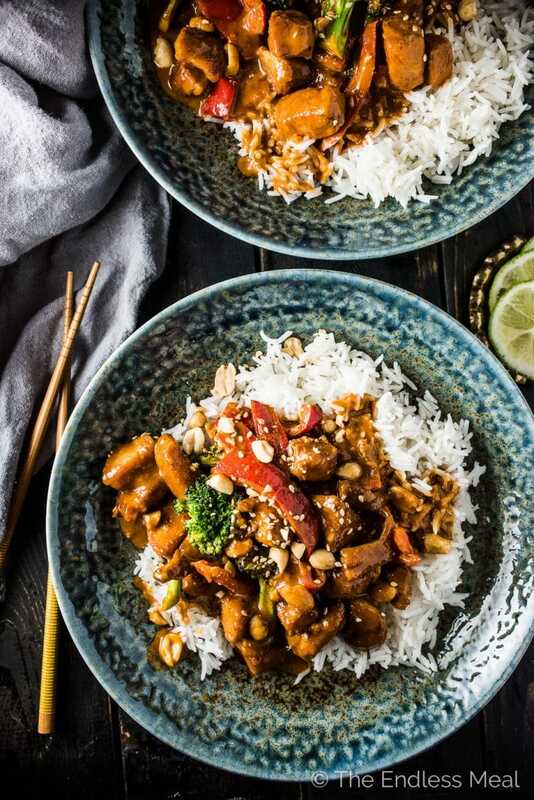 If you love this Saucy Peanut Chicken as much as I do, make sure to give it a 5-star review in the comments below! Toss the cubed chicken breasts with the soy sauce. Melt the coconut oil in a large skillet over medium-high heat. Add the chicken and let it brown, about 10 minutes. Remove the chicken from the skillet. While the chicken is browning, whisk all the Thai Peanut Sauce ingredients together in a medium-sized bowl. Add the bell peppers and broccoli to the skillet. Let them cook until they begin to soften, about 4 minutes. Add the chicken back into the pan and pour the peanut sauce over the top. Bring the sauce to a boil so that it thickens slightly and coats the chicken and veggies. Serve the chicken with some crushed peanut and sesame seeds over top and dig in! This is WAY too acidic/limey. Would be a much better recipe with 2 tbsp lime juice instead of 1/4 cup. Also a bit of honey or brown sugar would help the flavors intermingle. When I make it I’m getting sort of a harsh acid fast to it. I believe I follows the recipe exactly as is do you have any suggestions? Looks delicious! One of my kids has a peanut allergy…would almond butter been a good sub for the peanut butter? Looks great, I wanna try! Is mirin and rice wine vinegar the same? If not, can I use mirin as substitute? No, they’re not the same! Mirin is a sweet Japanese wine that you can buy in most supermarkets. It’s not drinking wine. Rice vinegar is a mild flavored vinegar made from rice. How will it do as left over.? I’ve enjoyed this the next day as leftovers for lunch! I made this for the second time last night as my kids requested it again. I have a feeling they’ll be asking for it again! That’s so great to hear!! This looks so good!! My husband and I aren’t big fans of red peppers. What would you suggest subbing for them? Would peapods work? Thanks! Pea pods would work great! Do you think some fresh cilantro would compliment this dish? It looks delish and I’m going to make it asap!! Hi Kristen! I’m having a difficult time trying to find rice wine vinegar. Do I need to combine rice wine and rice vinegar? 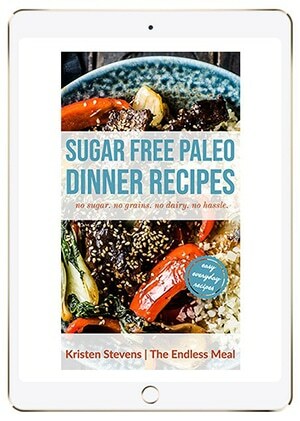 I adore Thai peanut sauce so I’m loving this meal Kristen! What a beautiful skillet meal! Thank you so much! I’m all about peanut sauce, too!! 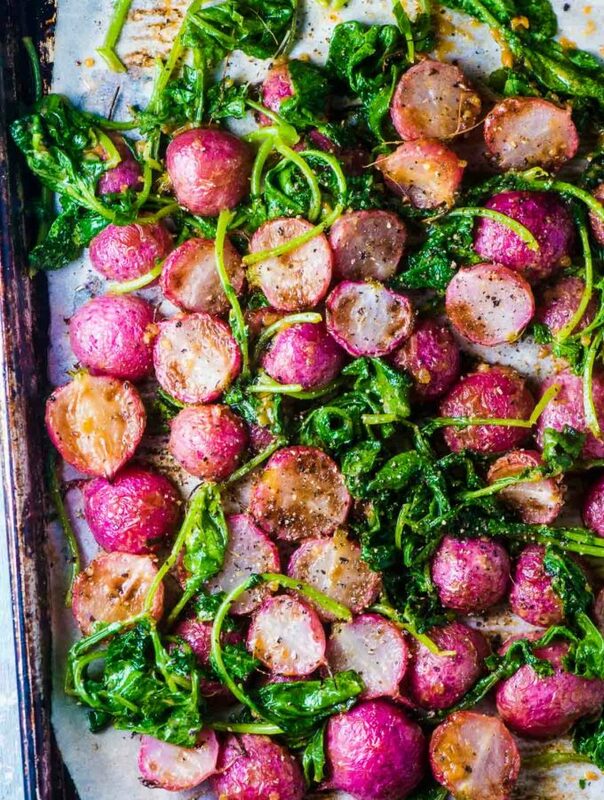 This is so perfect for when you want to have a hearty meal for dinner! Never knew peanuts would go so well with chicken and rice! Nepal was one of my favorite countries to visit! I hiked the Annapurna Circuit back in 2001 and LOVED it. You have such a beautiful country! Here I am admiring your dish and you admire my country. Thank you! Please visit here again, Kristen!